Spring in San Diego means Art Alive at the San Diego Museum of Art. Art Alive celebrates it’s 38th year and the stunning works of art on display in the Museum with more than 100 floral interpretations created by top local and national designers. It is fitting that when translated into Spanish, La Jolla means “the jewel”, because La Jolla truly is the diamond of the West Coast. 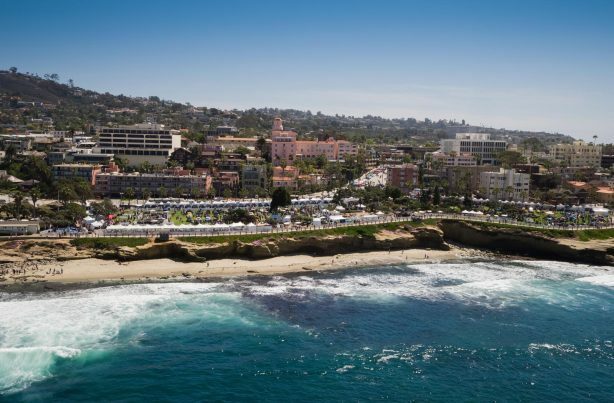 La Jolla has become the embodiment of luxury, class and style in San Diego. The chic allure of La Jolla’s avenues has drawn the finest automobiles to this coastal town for the La Jolla Concours d’Elegance. Largest tented flower show in the nation! Exhibits surround a central gazebo which stages continuous live music entertainment, announcements, and trophy presentations. Food pavilion and beer garden on site! Over 70 Top Tier Wineries and 25 of San Diego’s very best Chefs come together to create San Diego’s Classy Wine and Food Experience! Come sip, sniff, swirl and taste over 300 amazing wines. More than 35 fantastic Hillcrest restaurants are participating, giving foodies a chance to sample some of their best and signature dishes. From quaint cafes and French and Italian style bistros to five-star dining delights, this is the most anticipated self-guided culinary walking tour in San Diego! All proceeds from the event will be dedicated to funding the production of the block party & the funding of the mural activation. Enjoy live music on the streets of East Village featuring three of San Diego’s most talented acts and featuring a wide range of genre from jazz, funk, soul, blues, indie, and bluegrass. Enjoy East Village’s finest breweries on 13th Street & in Quartyard. This is the 40th year the San Diego Sportfishing Council has sponsored its special showcase of San Diego sportfishing. We hope you’ll take this opportunity to join us and discover a bit more of what the Port of San Diego holds for you. The 33rd Annual Avocado Festival includes local artisans on the Artisan Walk on Alvarado, Cazadores Margaritas at the Main Stage area, featuring local talent, food, wine garden, local beer, community stage, kid’s zone and Avocado Central (located in the center of the event) where avocados and trees can be purchased. Dine on unlimited gourmet tastings prepared by local chefs paired with sips of craft beer and cocktails, local wines, and spirits. The Sunday afternoon event is hosted in the lush courtyards of the Park Hyatt Aviara with vignettes of live music, lounges, lawn games, and boutique pop-ups. Guests will end their weekend with a fun-filled evening of the best North County has to offer! Rooftop Cinema Club is revolutionizing the outdoor movie-going experience as a place where friends and loved ones gather to enjoy amazing films, fantastic food, and top-shelf drinks, all while lounging in the moonlit shadow of the Downtown San Diego skyline. And as if that isn’t enough of a draw in and of itself, Rooftop Cinema Club’s guests are treated to state-of-the-art HD video, studio-quality wireless headphones, soft lounge-style deck chairs and cozy blankets for cool nights.